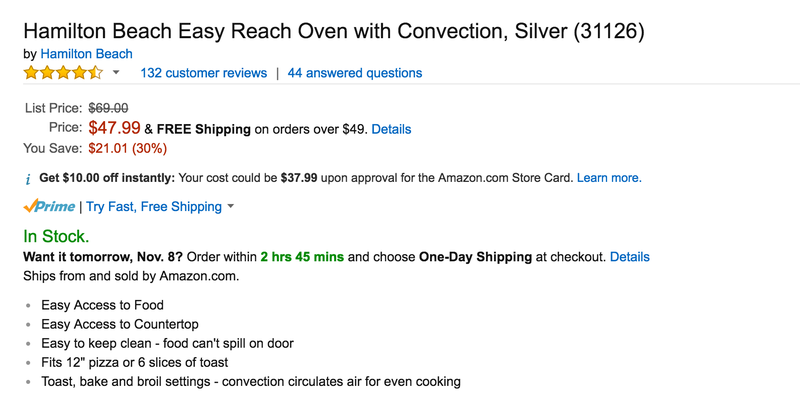 Amazon has the Hamilton Beach Easy Reach Oven with Convection in Silver (31126) for $47.99 with free shipping for Prime members or in orders over $49. That’s $20 or more under the average selling price and the lowest Amazon has offered it for. Walmart still charges $78 for it. Rated 4+ stars from over 130 Amazon customers. Small enough to fit on your counter but large enough to fit six slices of toast or a 12-inch pizza, the Hamilton Beach Easy Reach Oven with Convection has an innovative roll-top door to increase workspace, visibility, and access to the oven. With its large capacity, you can handle many of your cooking tasks without ever turning on your regular oven. It’s packed with different options for baking, broiling, or toasting. This oven also has convection technology using a top and bottom heating element and a built-in fan to distribute heat evenly for a uniform temperature. The 30 minute timer has a bell to let you know when baking is finished and the large window lets you monitor the progress of your meal or snack. The full-width crumb tray slides out from the front, allowing easy access for cleaning. Open the door and pull straight up to remove the door for fast cleanup. Removable parts can be washed in hot soapy water. A baking pan is included for preparing or reheating a variety of snacks, meals, or desserts. Easily adjust the rack for broiling, baking, or toasting.